An excellent and solidly built microphone that fits its remit well and happily goes beyond it. Excellent robust construction. Great transient response. Good side rejection for close mic'ing drum kits. 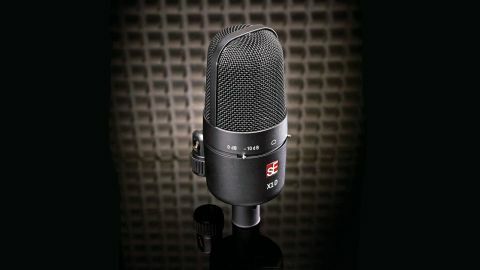 The idea of a reasonably priced family of microphones based around a basic large capsule design, with each mic aimed at a specific set of purposes has proven to be a winner for sE. The X1D is the latest addition to the range and is aimed at drums and percussion. As with all sE products it looks and feels solid and well built. There is a side mounted stand adaptor, and switches for the -10dB pad and bass rolloff, and the capsule has a built-in rubber shock mount that helps prevent knocks and vibrations being transmitted through the stand and body. The cardioid response capsule is titanium sputtered (coated) as titanium capsules are stiffer and so have a good transient response. "We compared it to an AKG D112 and an Electrovoice RE20 (both dynamics) and it came out very well"
As sE describes the X1D as a drum microphone, the first place we put it was straight into the bass drum. The side mounted adaptor makes it ideal for this purpose and it's easy to get it into place and the mount itself is firm and holds its position. The results are excellent. We compared it to an AKG D112 and an Electrovoice RE20 (both dynamics) and it came out very well. As you would expect from a condenser, the high-end response was very fine and detailed, but the low-end is all their too. The flat response was very impressive. Of the three microphones it captured the natural sound of the bass drum the best and with some radical EQ you can really hear how the excellent transient response of the capsule captures the whole spectrum of the drum. Moving it out of the bass drum and onto a floor tom, that bass response really came into its own. Floor toms are tricky beasts because you need to balance transient against a long low resonance. The X1D handles both with aplomb giving both warm lows and a crisp attack. The same was true going up to the racks. We often use condensers on toms, Neumann U87s being a usual weapon of choice, but we wouldn't be unhappy to have a set of X1Ds instead. Finally we went for the snare drum. On a more highly-tuned, smaller snare we preferred the colour of an AKG 414 but once we swapped to a deeper low-tuned drum the X1D won us over again. It sounded fat and punchy with a real clarity to the highs and we found we had to add far less EQ than with any of the other microphones we tried. Moving over to bass and guitar amps it showed its versatility. Bass amplification is notoriously difficult to capture and, although the playing was finger style so not necessarily in the percussive domain of the titanium capsule, it certainly didn't disgrace itself - good balanced low-end response with plenty of upper mid detail to bring out the clarity. The same on guitar and in fact it was here that we felt we got to understand what was going on a bit better. The X1D seems to have a slightly scooped response, pulling out a bit of low mid and emphasising the lows - great on cleaner tones where you want the clarity of the attack and a bit of bass for warmth. It is certainly an interesting alternative to the array of guitar microphones we would usually go for. "Its ability to step out of the drum world into other domains makes it a great general purpose studio tool"
So, while the X1D is probably most suited to its intended application of drum and percussion recording, it does cross over into other instrument groups too, particularly anything with a percussive element that would benefit from a fast transient response. That detailed high-end response allows you to tailor the click of a bass drum with EQ far more easily than with many dynamics whose response dictates the peak frequency, and at this price point it compares very favourably to some of the more expensive drum dynamics out there. That said, its ability to step out of the drum world into other domains makes it a great general purpose studio tool and one that you will find yourself reaching for long after the drums have been laid down.